Are you struggling with managing your social media accounts? Do you find that your pages aren’t growing in likes and followers? If the answer is yes, then you are probably making at least one of the top five mistakes in social media marketing. Social media has overtaken traditional media formats in recent years to become top of the list of ways businesses reach their customers and it’s not hard to see why. In 2018 there were an estimated 2.62 billion monthly active users and this figure is set to rise to 3.02 billion by 2021. With such a large audience pool you would be making a huge mistake if you were to think social media isn’t worth your time and effort. However, the digital world is an ever-changing landscape, so deciding where to focus your attention can be tricky and the rules of the game are constantly changing. You also must take into consideration the key differences between various social platforms. What may work for one may not necessarily work for another. So, let’s run through the top 5 most common mistakes and how to fix them to help you grow your social profiles. One of the most common mistakes businesses make when using social media, comes from a lack of understanding about how often you should be posting content, at what frequency, and at what time of day. Posting once a day will get you some engagement, but wouldn’t posting twice a day get you even better results? Why stop there? If I post four times won’t my engagement grow even further? Maybe, then why not post 10 times a day? For most social media sites including Facebook posting more than two or three times a day is going to exhaust your audience. You’ll want to spread these posts out to make sure that they aren’t competing in the news feed section, and to give you the best chance to capture your audience at various points in the day. You only have a certain number of followers so oversharing content or posting for the sake of posting is going to become spammy and you will risk losing existing followers. Remember to do some audience research to find out what times of day your followers are active online to ensure your posts gain the maximum engagement. Try to stay consistent with the times of day that you post. Remaining consistent helps you keep focused in generating content and your followers will over time come to expect an update. Facebook and Instagram stories are a fantastic way of reaching your audience and offer a variety of creative tools for businesses to generate content. You should be using stories for short-form content which you can post more frequently. The exception to this rule is Twitter. Twitter is a fast-paced platform that can be used in both a pro-active and reactive way. Businesses should aim for a minimum of around six tweets per day. Videos are the future of social media – FACT. Social media platforms place a higher value on video content than images or text. In a world where more people are watching YouTube than TV, social media sites are competing for your attention and it’s a fact that nothing grabs your attention more than a video. On average video content gets 2-3 times more engagement and views than if you were to upload a photo or text. Take the time to record more video for your business and the likes should follow. Social media should have a place in your overall marketing strategy, but to really get the most out of your chosen platforms you should be creating a separate social media strategy and within that strategy, you should set goals to work towards. Setting goals gives you something to aim for, a sense of direction, and will help you when things aren’t exactly going to plan. It’s important to remember your goals should be realistic, there is no point in saying I want to have 10,000 new likes a month if in the previous month you only grew by 20. Make sure you set a time limit to re-evaluate your goals, this way you can measure success and change your approach if necessary. At Copper Bay, we help clients prepare their social media strategies as well as helping them achieve their goals. It’s called SOCIAL media for a reason and far too often businesses forget about the social aspects. 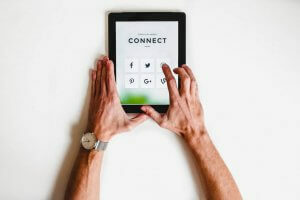 For several years now, customers have been using businesses social media pages as a customer service forum and that trend is not going to change in 2019. As a business, you need to embrace this new way of interacting with customers and ensure that you respond in a timely manner. Try generating more conversations and encourage interaction with your customers by asking more questions and posting engaging content. There are two types of content you should know about; value-based content and sales driven content. Sales based content is content put out with the intention of getting the user to complete a task whilst value-based content focuses on educating, inspiring, entertaining, or engaging with your audience. If you’re constantly selling to your audience then people are going to get annoyed and you can expect to lose followers. I mean we’ve all been approached by that pushy salesperson. You should try to post one sales driven piece of content for every three pieces of value-based content. Facebook’s newsfeed isn’t as fast-paced since the emergence of stories and the popularity of Instagram, so any content you put out on your news feed should be high quality and memorable. If you would like to book in a consultation to talk about how Copper Bay Digital could help you grow your social media presence call us on 01792 293 366. Copper Bay have helped me to develop a fantastic website. I worked with David who followed my brief and went above and beyond to ensure I was happy with everything. Their support service is wonderful. If you are looking for any form of marketing, website or graphical support I would highly recommend contacting Copper Bay. We have been working with Ben and the team at Copper Bay Creative now for about 4 years. They helped us design our website and provide marketing support for our social media efforts and in the production of a range of marketing collateral included print material. They are a totally responsive and supportive supplier, always there when you need them and coming up with the goods regardless of type of request and lead time provided.